Firstly, Google were convinced that the smaller cheaper 8GB model would far outsell the more expensive 16GB version. The logic was that the tablet would purely be a "portal" device and that cloud storage would be used as opposed to physical storage. However, it appears that consumers are not yet sold on the idea having their content stored on servers in the cloud and prefer to have it stored on the actual device. Also, the Nexus 7 cannot be upgraded with extra memory and therefore it makes sense to pay an extra £40 upfront to avoid any issues of running out of memory in the future. With this miscalculation, Google decided to manufacture more of the 8GB model which has perhaps contributed to the current ortages. Manufacturing of electronic devices can be a complex business with many different companies in the supply chain providing numerous parts to be assembled in one plant. Once initial contracts are signed with a manufacturer it's not easy to go back a month or two later and demand they start producing five times as many units. These manufacturers are also producing parts and devices for other clients and they just can't simply treble production overnight. Some components are also sometimes hard to find themselves, such as memory, screens and processors which all compounds the problem. 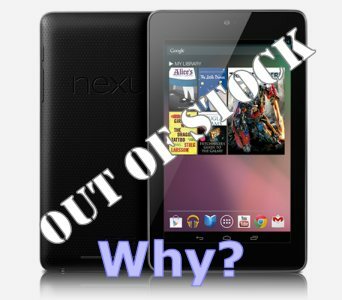 The Nexus Seven is the first of this range that has actually been a success with the Nexus One only being sold directly through the Google Play website never really taking off. However, Google seem to have hot a sweet spot now with a low retail price, great reviews and being first to market with a relatively small sized ablet which the public has embraced. This success with hardware is not something Google has been used too, however their current supply issue I suppose is a nice problem to have compared to a lack of sales they have previously been used too. It is also important to note that Google have stolen a march on their rivals Apple being first to market with a small tablet device. Rumours are still circulating the internet of an impending 'Mini iPad' due in quarter 4 of 2012 and you can be sure Apple won't want Google to get too much of a dominant market share of this sized tablet.